Interested in abstract painting, but don’t know where to start? Acrylic pouring is a fun way to loosen up and create beautiful paintings in a short period of time. Fluid art dates back to the 19th century but gained public recognition with American abstract expressionists such as Jackson Pollack. 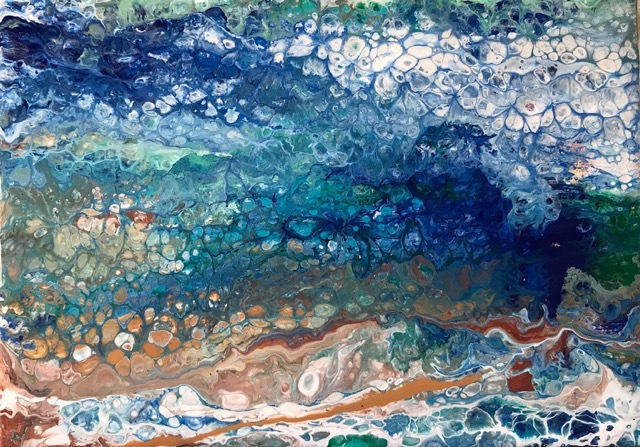 Today, fluid acrylic pouring artists use new mediums and a wide variety of techniques to achieve intriguing effects and textures. The process is a delicate balance of planning, surprise and manipulation. 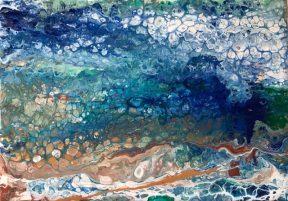 In this workshop, Joyce will provide an overview of fluid painting mediums, recipes and paint mixing. 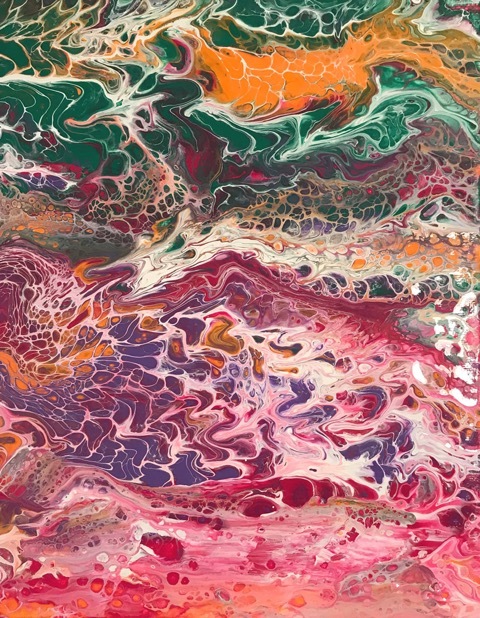 She will show examples of paintings created using different pouring techniques, and then demonstrate three techniques. With Joyce’s guidance, students will try each of these on their own, completing at least three 8×10 paintings to take home. 2 oz bottles of craft paint at Michaels or AC Moore are fine (ie craftsmart, folk art, delta). Do not buy glossy. Joyce graduated from Bates College with a B.A. in Fine Art and attended the Skowhegan School of Painting and Sculpture. She started out painting in oils, but fell in love with the pure pigment of pastels in 2002 and has painted pastel landscapes for many years. Around 2014, Joyce became interested in nature-inspired abstracts and also began mixing other media with her pastels. Drawn to layers of color, circular shapes and interesting textures, she started experimenting with acrylic pouring. It was love at first try. “I love the immediacy of making a painting in one sitting, and I find the process relaxing, exciting and challenging. Some of my pours are purely abstract, but many continue to be inspired by the shapes and colors of nature.” Joyce is a juried member of the Cape Cod Art Center and served on the Board of the Pastel Painters Society of Cape Cod. Joyce has exhibited and sold her paintings across Cape Cod and resides in Marstons Mills.